Super Soup Challenge – The Rematch! First it was the copy of a cookbook I was sent that was all about Italy – food and otherwise. Then, it was the stack of Italian cookbooks on the shelf at the boy’s house that I got lured into. After that, the theme of gnocchi for Hay Hay It’s Donna Day. The next movie in my Netflix list was Italian for Beginners (which I still haven’t watched). When I got the latest Food and Wine magazine in the mail and saw the Italian themed cover, I threw my hands up. I get the point – we’re having an Italian food moment. It’s everywhere. 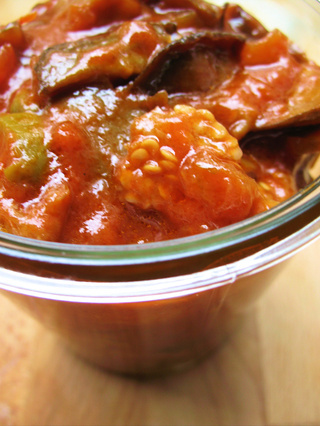 Caponata is one of my favorite Italian dishes. While I have heard of people serving it warm as a side dish, I prefer the cold "antipasti" version. Making this gave me an excellent excuse to crack open Jamie’s Italy by Jamie Oliver. I really love this cookbook for all sorts of reasons – Jamie’s loose writing style, the beautiful first hand experience photos, and the rustic feel of the book. If you haven’t checked it out yet, do so. I used Jamie’s recipe as a springboard for my caponata. While he likes his a little firmer, I appreciate digging into the stewed, comforting texture of it when it’s been cooked a bit more. The seeds in the eggplant don’t bother me so much since it sort of falls in line with the stewed texture – to each their own. I also like mine after it sits for a day or two and the flavors really merge and mingle. Enjoy this on some toasted bread, with slices of prosciutto & a glass of wine, or as accompaniment to roasted meats. and parsley stems and continue cooking for another couple of minutes. in the drained capers and the olives and drizzle over the herb vinegar. around 15 minutes or until tender. sprinkled with the chopped parsley leaves and the almonds if you like. This seems like it would be good with a poached egg as well. Or maybe spooned over a firm fish, like swordfish. Looks great. This looks like a great dish. You just can’t go wrong with ripe tomatoes, eggplant, aromatics and good olive oil. I’ll have to put this on my to do list. BTW, the right margin of your instructions section cuts off the last couple letters. I think caponata as an accompaniment to swordfish would be awesome! what a good suggestion! I think its fixed! Thanks for stopping by. 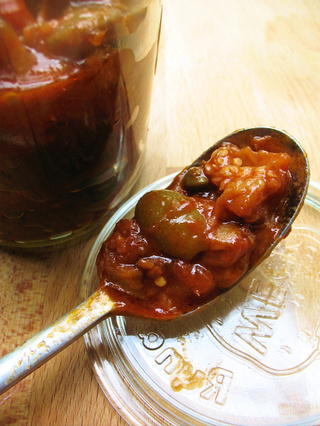 Like you, I like to softer texture better in a caponata. I make mine with black oil-cured olives, but no herbs, to let the flavour of the vegetables shine, adding just a drizzle of balsamic vinegar when the dish is almost done. You mention “seeds in the eggplant”, did you mean to write “tomatoes”? Both, really. Some recipes say to seed the eggplant…some dont. I dont mind seeds of either…within reason…especially since I do let mine cook down a bit more than say Jamie’s recipe would. I love caponata! Yours looks delicious! My son and I have enjoyed quite a few recipes from Jamie Oliver’s Italian cookery book. We especially enjoyed the gelato, pizza and bruschette recipes.Jamies enthusiasm is contagious and the photography is inspiring.